Chef Jeffrey Ault's experience began with the lessons of his grandparents on the importance of living off the land and the sustainability and preservation of food. By the age of 8, Jeff was routinely engaged in the growth, upkeep, preservation, and cooking of almost two acres of his family garden in western Maryland. Jeff attributes most of his knowledge to his grandparents who survived the great depression through these methods. 25 years of experience in a broad horizon of global cuisine has shaped his style. Of particular influence were Chefs Sean Brock and Travis Grimes of Husk restaurant in Charleston, SC where Jeff was reunited with his love for food preservation methods practiced throughout Appalachia and the world. Locally, he operated multiple restaurants at Hollywood Casino and was Executive Chef and F&B Director for Hilton Corporation. 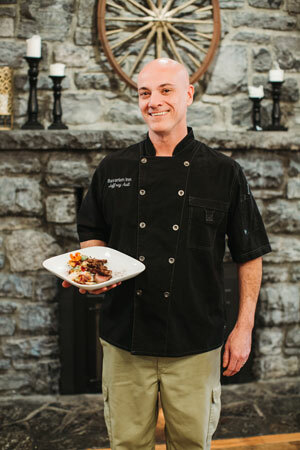 Jeff is no stranger to the Bavarian Inn spending nearly a decade with us preparing food for events and weddings. Jeff's primary focus is wild game and local sustainable produce. He developed a charcuterie and preservation program for the inn to ensure the freshest items of the spring and the summer all year-round. When Jeff is not busy with the inn, he is involved in house flipping, fishing, and spending time with his wife and son.